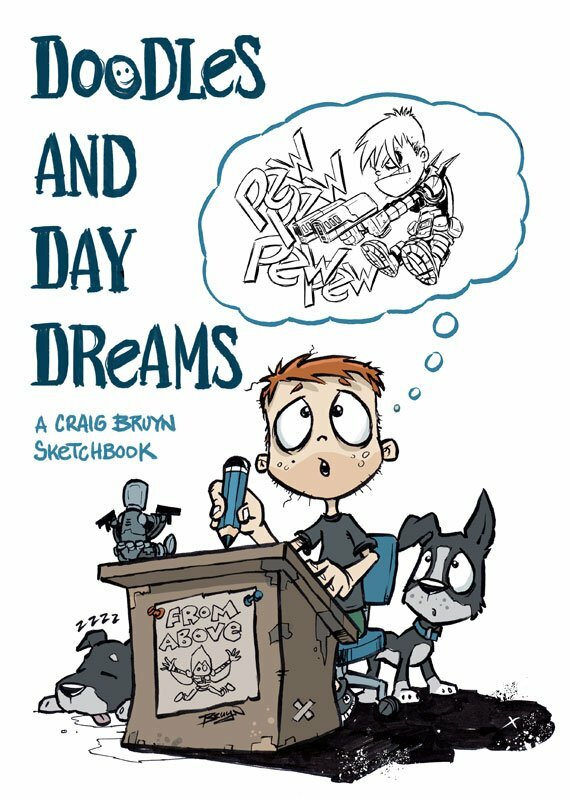 Craig Bruyn is a recent discovery of mine, though he’s been creating comics for years. He started publishing the quarterly series From Above in October 2013 and more recently started the humor-adventure webcomic Bark n Bone, one of my favorites anywhere on the internet. He’s also drawn comics based on the popular toys-to-life game Skylanders and collaborated with Ryan K. Lindsay on the Ink Island one-shot. I interviewed Craig about the comics scene in Australia, being boxed in based on your art style, and the challenges of breaking in despite obvious talent. Check out our discussion below. I love your art style. It’s very expressive but definitely has some grit to it. Is there a reason for the duality in your art, or is it simply the style you developed naturally? I think it’s an evolution of many influences over the years. As a kid, it was very much Peanuts and Calvin and Hobbes. Then everything from Tim Burton, to Jim Lee, and more recently a mix of video games, Frank Miller, and Skottie Young. Skottie’s inking style was a revolution to me, finally a technique I could implement with my shaky hands. How did Bark n Bone come together? After working on From Above I was a bit [worn down] from making print comics. It requires such a high overhead, so the prospect of webcomics really intrigued me. Plus, webcomics give readers the opportunity to come aboard for the journey as I was still working on the story. I knew after doing sci-fi in From Above that I wanted to draw something in the fantasy or steampunk realm. I wasn’t ready for a steampunk project at that point so I went with fantasy. I knew I wanted something in color that involved humour and was easily accessible. I also wanted to play around with the traditional hero trope and took an archetype of a stereotypical minion (skeleton guard) and made him a protagonist. And it’s almost impossible for me to do a story that doesn’t have a dog in it. There are SO many webcomics on the internet now. How do you get eyes on yours over all the others? by going with the free webcomics model. In fact, its readership is well down from what From Above achieved at its peak. That said, its a project I’m quite proud of and I intend to complete the first story arc. Do you plan to publish a print edition of Bark n Bone? I’d always considered packaging it up into a self-contained volume, but it isn’t looking like printing it is viable at this stage. What’s the comics community like in Australia? Do you get together with other creators often? Living as far out of the city as I do, I don’t really get the chance to mingle with the local comics community that much these days, but when I was on the convention circuit I had an absolute blast. I do catch up with the odd creator every now and again and there’s certainly a wealth of talent in Australia. Did you and Ryan K. Lindsay meet prior to working together on Ink Island? I believe we first met at OzComicCon in Adelaide. Ryan is one of the nicest, smartest, talented, and most humble people you will ever meet. I still can’t believe I got to do a book with him, or how he managed to put up with working with me! Were you worried about offering a 22-page comic on Kickstarter for just a dollar? I know very little when it comes to Kickstarter and had never considered crowdfunding a book. Ryan had completed a number of successful campaigns and had a very good rationale behind why he wanted to set that price, so I trusted him implicitly with it. Is it difficult to make headway in the comic book industry when you’re continents away from its largest market? Definitely. It’s difficult wherever you are, make no mistake there. But lacking the opportunity to get face time with editors/publishers is a real challenge. But it’s not impossible, looking at some of the amazing talent that has come out of Australia working for big publishers. How did you land drawing duties for Skylanders at IDW? Pure luck, right place, right time. I was attending SDCC and fortunate to have the opportunity to chat with David Hedgecock from IDW. He was such a nice guy and I’m really stoked he took the time to chat with me. He looked at some of my early work for Ink Island stuff and mentioned the Skylanders gig. We touched base a couple of times after SDCC and I ended up doing a couple of covers and a short story. I think only one of the covers went ahead, though, because the title sort of dropped off the radar, which was really disappointing as I was really proud of the two covers that didn’t end up seeing the light of day. Was there a style guide for the brand that you needed to adhere to in the comic? Yeah, Skylanders is an IP and you need to draw on spec. Skylanders sequential page. Colors by David Garcia Cruz. Did you find that restrictive? It’s a challenge, of course, and to an extent, it does restrict some of your natural technique, particularly if you have loose, organic linework. But at my day job in the toy industry you’re always forced to draw out of your comfort zone, so it wasn’t too much of an issue. And I really love the Skylanders franchise and its art style. Do you feel like readers and publishers box you into all-ages work due to your art style? Probably. If you’re an editor looking for someone for your next project [it makes sense to] go with who you know fits that style. As for publishers – ha! I don’t think they’d even know me to box me in. Readers? Well, art is your first gauge of tone for a story so they’ll naturally go with that [first impression]. But I prefer to draw all-ages stuff over something like a horror comic anyways. Building a career is hard, especially in an industry as coveted as comics. You hope for opportunities, but can’t necessarily count on them. Your work is great, you have people reading your work, but I imagine you’d like to do more. Do you have any kind of overarching plan in comics, or can you only take each new day as it comes? Building a career in comics is very hard. As far as goals go, I’d say I’ve maybe achieved 5% of what I’d like to. And I have to be realistic that that may be a far as I ever get. But the desire to create is so strong that so I’ll never stop trying. In the meantime I’ll just keep creating more and more content, telling more and more stories. Nothing will ever happen if I don’t keep creating more opportunities to let luck to come my way, and as stereotypical, as the saying is nothing worth doing is ever easy. You can follow Craig on Twitter and Instagram. Learn more about his work by visiting his online portfolio and find his comics digitally on ComiXology. Matt Chats is an interview series featuring discussions with a creator or player in comics, diving deep into industry, process, and creative topics. Find its author, Matt O’Keefe, on Twitter and Tumblr. Email him with questions, comments, complaints, or whatever else is on your mind at matt@mattwritesstuff.com.